A metropolis today is an artificially created landscape full of public spaces marking the historical past; streets, along which streams of transport move, and internet networks by means of which information is transmitted at lightning-fast speed; where a host of various cultural institutions, even the places where they are concentrated – are part of the culture industries. In such a complex urban structure, traditional culture exists under modest conditions and folk music can be heard. Those with no interest in these things are unlikely to come across signs of its existence in the noisy intersections of the city, but the more inquisitive inhabitants of the city know that traditional culture has adapted to flourish in the city, put down roots like moss on a stone and makes urban culture attractive and gives it a distinctive character. After World War II, Vilnius was a city of newcomers, full of students who had come in from every corner of Lithuania. They were village children who had done every kind of work in the fields: raking hay, digging potatoes… Not spoilt, the sons and daughters of farmers used to a simple life, they studied diligently in the institutes of higher education. They were called the ‘first generation to come from the plough’: they no longer worked the land; they left their parents’ homesteads and went to cities to look for another kind of livelihood. This description was a mocking one, meaning to say that in the corners of the subconscious of the intelligentsia that had come from the countryside there were still ploughs and harrows standing around, scythes and rakes hanging on the wall, and baskets lying on the ground, that they still thought like peasants, even though they used foreign loan words and scientific terminology. The exiles themselves from the villages did not go on the defensive but often spoke and wrote that the memories they had of the places they were from and the experience they gained there were very dear to them. Characteristic of the city inhabitants / village children was their special feel for nature. Their inner life was greatly affected by their distance from nature, in whose embrace they were used to finding calm and regathering their strength, and the disconnection from the earth, which provided bread, health, energy and inner strength to their grandparents and parents. The beautiful, unspoilt nature and the earth which was in harmony and which gave life, the new city dwellers began to love with the love of exiles. They felt the same love for their parents’ homesteads left behind. The sensations they had experienced in their youth, the images, sounds and smells connected with farm work simply could not be erased. Poets, artists and composers felt that the deepest and purest source of their creativity was village life, the vitality of nature experienced in their childhood. A similar experience really could not be provided by the hustle and bustle of the city, the never-ending work, official meetings, appointments, energy-draining public duties. So, remaining children of the old village way of life, while looking there for the most beautiful images, colours and sounds, they could be their most creative. The composers Julius Juzeliūnas, Bronius Kutavičius, Feliksas Bajoras, and Vytautas Montvila wrote pieces inspired by folklore. One could say that artists felt they had a dual identity: they were people both of the village and the city. In a host of compositions, culture and nature were juxtaposed, e.g. in a poem by Marcelijus Martinaitis he describes Kukutis’ dream, in which Cathedral Square, paved with stones, turns into a flowering meadow. Martinaitis and his generation could not immediately become city dwellers. They had to come to love this city and its environs, they needed time to be able to feel in this new place like they were in a village, where everything was familiar and dear to them. Only then could they say: ‘Oh Vilnius, city of mine’. In 1968, folklore ensembles began to be formed in Vilnius. This was a transformation of the village singing tradition, a new urban continuation of it. In 1968 the student folklore ensemble Ratilio began rehearsing at the University of Vilnius. Later, several more ensembles were set up: in 1971 – Sadauja, in 1973 – Poringė, in 1979 – Dijūta and Ievaras. The urban folklore ensembles were new associations, different from the village communities, whose members almost all were locals, with their roots in their native soil, like trees. The members of these ensembles had come from all over and like plants slowly put down their roots in new soil. 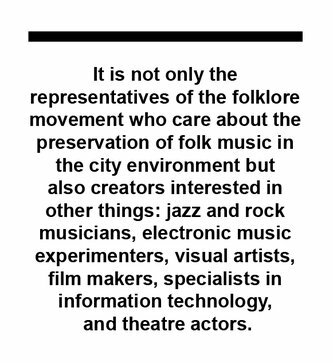 The folklore movement that had spread in the city had inevitably to express itself in forms typical of urban culture. 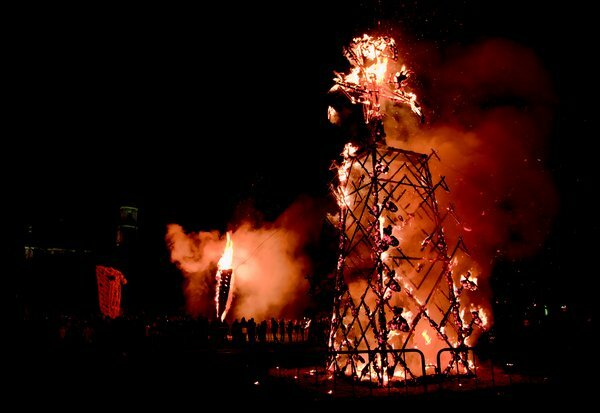 The first folklore festival Skamba Skamba Kankliai took place in Vilnius in 1973 and has subsequently been held annually. The places for the concerts and singing were the courtyards of Vilnius University with their excellent acoustics, while the noisy dances took place in Daukantas Square. Later, the festival expanded and concerts began to be held on the territory of Vilnius Castle, in the gothic Bernardine Church, and the Music, Cinema and Theatre Museum. There was no shortage of a bustling crowd of folklore lovers in the surrounding streets and squares as well. This festival is still taking place and now, with the lilac in bloom and the singing of nightingales, folk music can be heard in the city. Several generations have already participated in the festival, the veterans of the folklore movement have had children and grandchildren, so a third generation of Vilnius residents is now taking their little ones to the same courtyards in the Old Town. 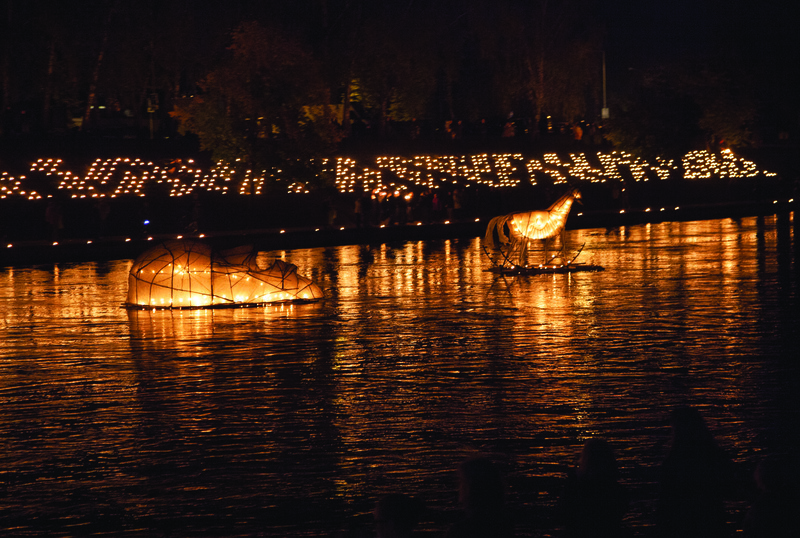 What is this vibrant festival that takes place every spring in Vilnius? 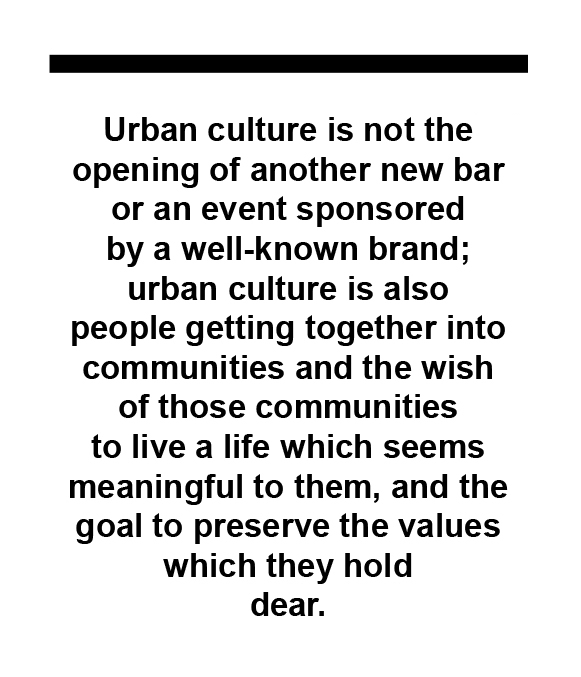 A strange and unrealizable wish to return to the village, or the reverse – the creation of a city culture? One would like to think that it is roots being put down in the city, the absorption of its spaces (in 2017 for the first time an attempt was made to sing not just in old part of the city, but also in the new residential areas). 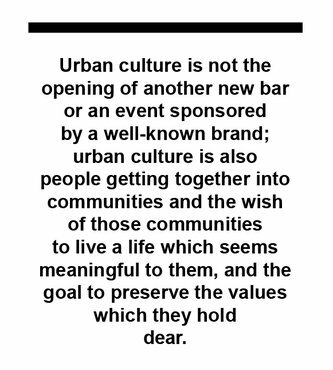 Urban culture is not the opening of another new bar or an event sponsored by a well-known brand; urban culture is also people getting together into communities and the wish of those communities to live a life which seems meaningful to them, and the goal to preserve the values which they hold dear. In the 20th century it is not just the exiles from the villages that are getting together in the folklore ensembles but also young people born and raised in the city. However, the desires of both are similar. 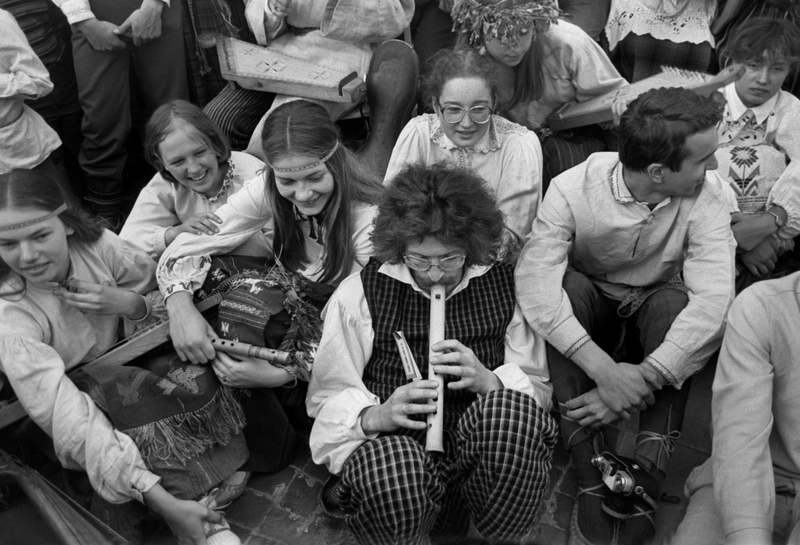 The folk songs or folklore improvisations of youth ensembles are often calm and slow. It would seem that this is precisely the kind of music that people lack, and that this what people miss. It is not for nothing that at the 2017 Skamba Skamba Kankliai festival there were quiet dances to the accompaniment of kanklės, there was more than one concert of a meditative nature, called Night Music. Those who are continuing the tradition in the 21st century are not farmers tied to the land and nature but ‘free artists’ to whom traditional culture is not a repertoire that has been put together over a long time and preserved in the memory, but rather a freely chosen set of cultural signs and meanings, often enriched with the signs and meanings of other cultures. The core of those who foster traditions is made up of the most active and the most competent people. They are the ones who attract and interest others through their activities. Around them come together various volunteers, for many of whom the fostering of tradition is only a stage on their creative path or just short-term cooperation. It is the rare artist or composer today who constantly interprets ethnic culture but there can come a time on everyone’s creative path when something based on the idea of ancient music appears, for example, the amazing Vaclovas Augustinas song ‘On the Other Side of the River’ (Anoj pusėj Dunojėlio; 2006), the harmony and texture of which so stimulate the imagination that it seems you are listening to a folk song and can see scenes of Lithuania from a bird’s-eye view; the gently rising and falling work by Ričardas Kabelis ‘The Mountain Sutartinė’ (Kalno sutartinė; 2011) seems to delineate the contours of a castle hill in the Lithuanian landscape. Living tradition in the 21st century in the city is multi-faceted and multi-layered, and in continuing it, connections are constantly being created amongst diverse musical styles, as well as the communities nurturing them. The continuation of contemporary musical traditions is similar to a polyphonic score in which voices not infrequently intertwine. 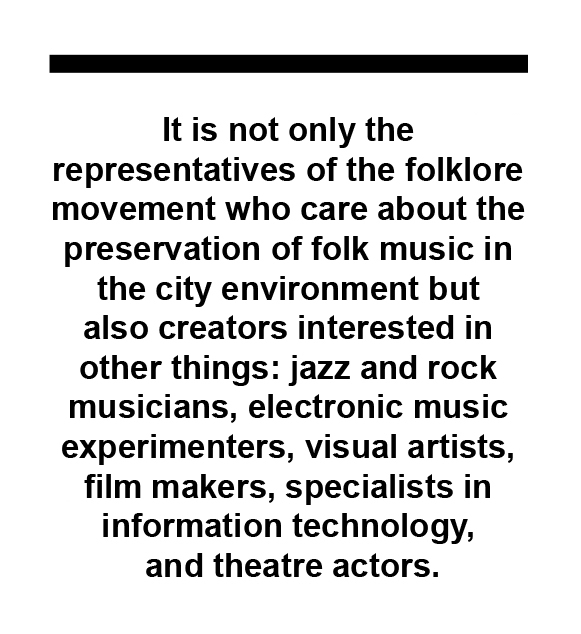 It is not only the representatives of the folklore movement who care about the preservation of folk music in the city environment but also creators interested in other things: jazz and rock musicians, electronic music experimenters, visual artists, film makers, specialists in information technology, and theatre actors. In exactly the same way other traditions are continued employing outside forces, their custodians sometimes receive conscious but sometimes also unexpected support of representatives from various other fields. 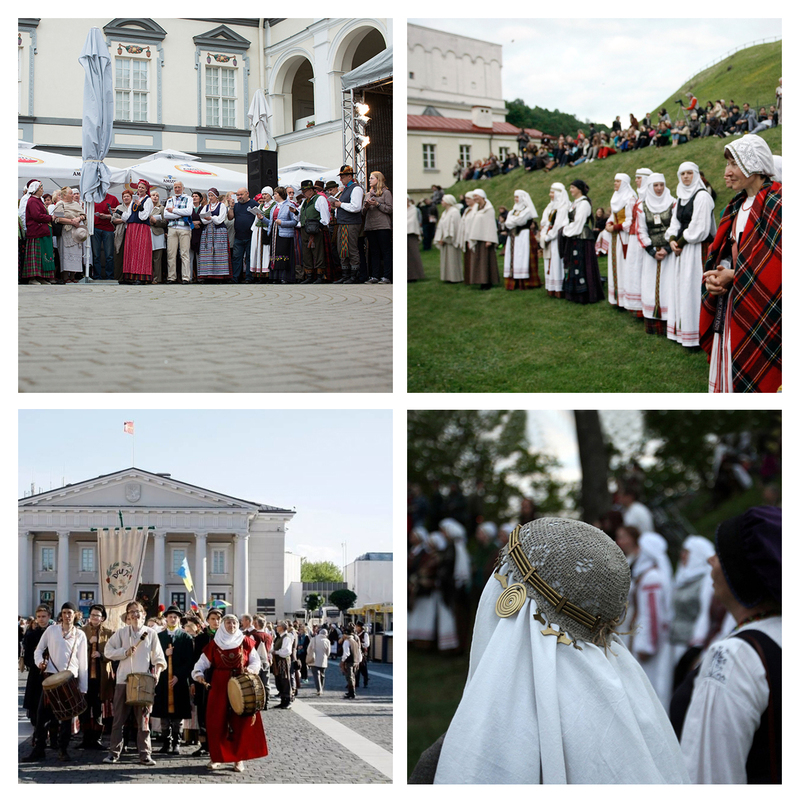 The first city folklore festival Skamba Skamba Kankliai has been held in Vilnius's old town each year since 1975. Photo: from the archives of the festival. Folk music, like other kinds of music, is for city dwellers entertainment to fill their leisure time. It can be heard on a stage or be spread from loudspeakers, flash across a TV screen and surprise one by the distinctive way in which it is performed, with new interpretations, using new technology to create an impression. In programmes for demanding viewers folk songs, instrumental music, and traditional dances are often combined with the visual arts. Sometimes the visual aspect of an event can be even more important. 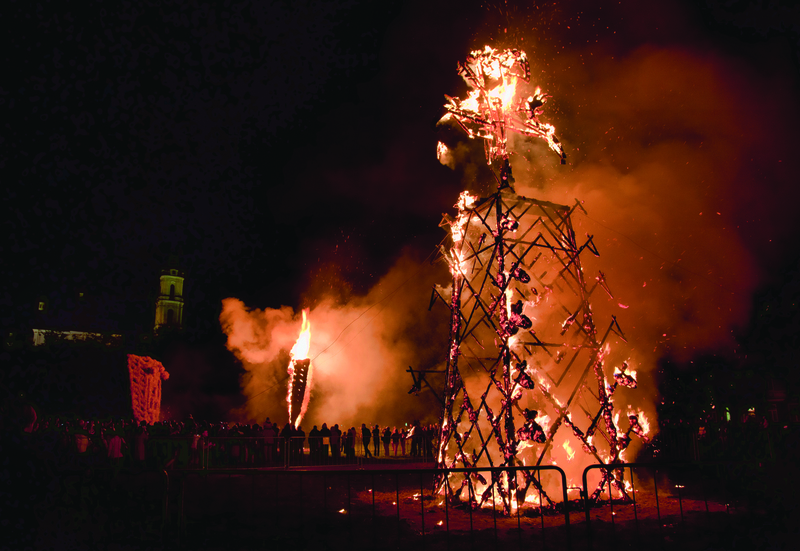 Since 1995 in Vilnius on the occasion of the autumn equinox impressive fire mysteries take place, those gathered together watch how straw sculptures are set light to one after another, with flames and sparks lighting up the sky, and listen to folk music. And since 2005 on the occasion of day and night being of equal duration the Neris river becomes a winding, glittering band flowing through the city: on its banks candles are set out in the traditional patterns used in woven sashes, and those partying there can at the same time listen to the sounds of the music. The participants in the folklore movement have always tried and still try to perform in the various spaces in the Old Town, which stand out because of the right acoustics, can serve as impressive backdrops or be pleasant and comfortable for the audiences. The performers of the ancient sutartinės are noted for searching for the right sound, putting on their impressive concerts of ancient polyphonic music in the gothic church of St Francis (the Bernardine Church) and the baroque church of St Catherine, and for researching the acoustics in the narrow small streets of the Old Town. In 2012 an unusual event, The Sutartinės Path (Sutartinių takas), was planned and took place in the small Universiteto, Gaono and Stiklių streets, stretching from the university to the town hall. On this path, several groups performing sutartinės sing and play the Lithuanian folk wind instruments called skudučiai (sing. skudutis) at the same time, while the listeners walking along that path can hear the voices of one group slowly becoming distant and fading and the singing of another group becoming louder. 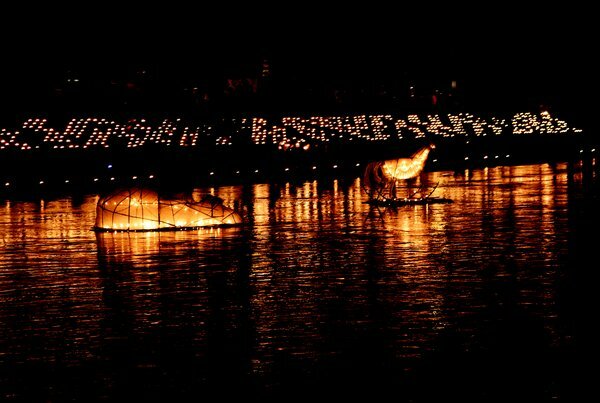 Later, as it gets dark, the singing of sutartinės with the performers standing in a large circle begins. The concept is changed to some degree every year. In 2017, which has been named the year of castle hills, a new tradition was born: singing on the castle hills and on the other Vilnius hills, overgrown with trees and marked with paths. In the spring of 2017 groups of folklorists sang military songs and the ancient sutartinės on Stalas Hill, the Hill of Gediminas’ Grave and the Rokantiškės Castle Hill, from which picturesque panoramas open up. At present the largest centre of Lithuanian folklore is not some region but the capital Vilnius! It is precisely here that ideas for fostering tradition are largely born, and it is from here that those ideas spread in waves throughout the whole country. In this modern city, the folk music that is heard had its origins in the villages, but for it to renew itself it no longer needs to drink from a spring of living water and to constantly maintain close contact with the villages. In recent decades, the soil for this music and the spring that refreshes it is right here, in an urban environment. Folk music has shown itself to be resilient and capable of being one of the most distinctive layers of the city’s music. In its new environment, it did not become weak and wither away: it was nurtured not just by a small group of people, as it had been in the villages, but by many cultural associations and has become even more interesting and diverse. Martinaitis, Marcelijus (2007). Oh Vilnius, Village of Mine. Internet daily Bernardinai.lt, 26 04 2007. See: http://www.bernardinai.lt/straipsnis/2007-04-26-marcelijus-martinaitis-vilniau-kaime-mano/4601. Matulevičienė, Saulė (2007). ‘Saulės Matulevičienės pokalbiai su garsiąja dainininke Veronika Povilioniene [Saulė Matulevičienė’s conversations with the famous singer Veronika Povilionienė]’. Liaudies kultūra 1: 53–73.